The Teradek Bolt Pro Multicast Wireless Transmission System is a latency-free wireless transmission system that sends 4:2:2, 1080p60 video with less than one millisecond delay. 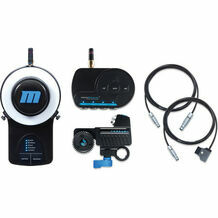 The Bolt Pro system comes in a set of one transmitter and one receiver. The transmitter features an internal antenna and four LED indicator lights. 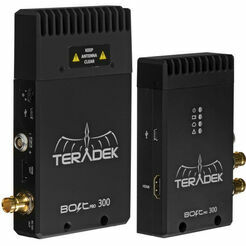 The Teradek Bolt Pro Wireless HD-SDI/HDMI Dual Format Video Transmitter/Receiver Set features internal antennas and offers a fan-less receiver that includes a USB 3.0 output, which allows you to ingest video directly into your computer or DIT cart with ease. This model supports metadata and timecode pass through. It supports wireless HD video with zero delay (<1ms) for up to 4 receivers. 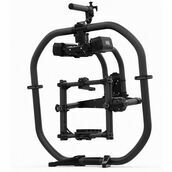 The transmitter accepts either HD-SDI or HDMI input, and the receiver outputs both HD-SDI and HDMI. The Bolt 300 has a range of 300ft.